Lawrence Olajuwon Timmons (born May 14, 1986) is an American football linebacker for the Pittsburgh Steelers of the National Football League (NFL). He was drafted by the Steelers in the first round of the 2007 NFL Draft. He would later win Super Bowl XLIII with the Steelers over the Arizona Cardinals. He played college football at Florida State. Timmons attended Wilson High School in Florence, South Carolina, where he played football and ran track. In football, he played tight end on offense and linebacker on defense. He was teammates with Justin Durant until his junior season. During his senior year, Timmons registered over 150 tackles and two sacks, while also catching 47 passes for over 800 yards and five touchdowns as a tight end, which earned him all-state first-team honors. He was also awarded as the Defensive Player of the Year and received Super Prep Elite 50 honors. He was also selected to play in the 2003 East-West Shrine Game. In track & field, Timmons competed in the long jump event, recording a career-best leap of 6.55 meters at the 2003 SCHSL State Championships, where he placed sixth in the finals. He was also a member of the 4x100m and 4x200m relay squads and was timed at 4.6 seconds in the 40-yard dash. Regarded as a four-star recruit by Rivals.com, Timmons was ranked as the No. 5 outside linebacker prospect in the nation, just behind Brandon Siler. He took official visits to North Carolina, Florida State, Florida, and Tennessee, before committing to the Seminoles. In his true freshman year, Timmons played in all 12 games including the Seminoles' Gator Bowl victory over West Virginia, although only limited minutes mainly on special teams and as a backup linebacker. He recorded 12 tackles, 11 of which were unassisted, which ranked second among the Seminole freshmen behind Jae Thaxton. A season-high three tackles came against Alabama–Birmingham. As a sophomore, Timmons ranked second on the Seminoles' depth chart at strongside linebacker behind Ernie Sims. He played in all 13 games, both at linebacker and on special teams, as well as defensive end in some third-and-long formations. Timmons finished the year with 35 tackles (17 solo), which ranked him third on the team behind Buster Davis and Sam McGrew, as well as three quarterback sacks, which also was third-best among all Seminoles behind Kamerion Wimbley and Marcello Church. His season-best performance came in the ACC Championship Game against Virginia Tech, when he recorded eight tackles, six solo, two quarterback sacks and two QB hurries. After Sims decided to forgo his senior season, Timmons took over as the starter at strongside linebacker. He had a great season recording 79 tackles and five sacks, and was honored with All-American third-team and All-Atlantic Coast Conference first-team. He finished his college career with 126 tackles and eight sacks. Timmons (94) playing against the Baltimore Ravens in 2008. Timmons took over as starter for the 2009 season following the release of Larry Foote, who had wanted out due to Timmons's increasing playing time. Foote would return to the Steelers the following year to be Timmons' backup. 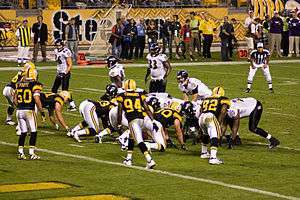 On August 23, 2011, the Steelers gave Timmons a six-year/$50 million contract extension for his performance throughout the 2010 NFL season. His rookie deal expired at the end of the 2010 season and he was a free agent, however the Steelers signed him to an extension after the NFL lockout was resolved.. Timmons numbers dropped from the previous season due to him moving from his normal inside linebacker position to outside linebacker, filling in for an injured James Harrison. He still had a solid season recording 93 tackles, 2.0 sacks, 2 FF and an interception. Timmons had yet another solid season in 2012, this time recording 106 tackles, 6.0 sacks, 2 FF and a career high 3 interceptions. He also recorded his first career NFL touchdown against the Cleveland Browns on November 25, 2012 intercepting a pass from Brandon Weeden. In 2013, Timmons turned in another great season for the Steelers leading the team with 126 tackles, 3.0 sacks 2 INT and a FF. This was the 2nd time in the last 3 years he led the team in tackles. Due to the drafting of Ryan Shazier, the Steelers moved Timmons from the mack to the buck linebacker in the Steelers defense in 2014. He had another excellent season and was recognized for it by being named to his first career Pro Bowl on December 23, 2014. On January 2nd, 2015, Lawrence Timmons was named Second-Team All-Pro for the first time of his career. Timmons's mother, a huge basketball fan, named Timmons after NBA legend and Basketball Hall of Famer Hakeem Olajuwon by giving him the middle name Olajuwon. He has three children: Lawrence Jay Timmons, Luke Timmons, and Leah Timmons. Luke and Leah are twins. ↑ "Lawrence Timmons". databaseFootball.com. Retrieved December 21, 2012. ↑ Steelers reward LB Lawrence Timmons Retrieved 24 August 2012. ↑ "Lawrence Timmons Stats". ESPN Internet Ventures. Retrieved 5 March 2014. ↑ Despite lack of expertise, Timmons ready for BCB Retrieved 24 August 2012. 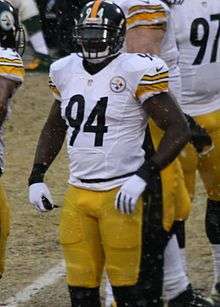 Wikimedia Commons has media related to Lawrence Timmons.